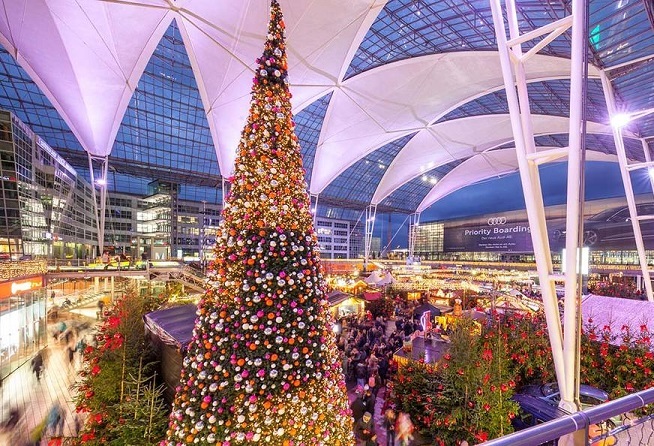 When the festive season rolls around, it’s an ever-popular attraction for the airport region and loyal fans from all over the world: We’re talking about Munich Airport’s Christmas and Winter Market, which is marking its 20th anniversary. Until December 26, 2018, the world at the Munich Airport Center will once again revolve around handicrafts, toys and traditional Christmas treats, both sweet and savory, daily from 11 am until 9 pm. The 44 booths make the market a perfect setting for a winter stroll, shopping for gifts, sampling the treats and taking in the seasonal sights, sounds and aromas. And sure to be a big hit again this year is the centerpiece of the market: the spacious ice rink. There’s no better place to show off your skating skills or try out “Eisstockschiessen” – Bavaria’s answer to curling. Rental skates – and curling rocks – are available at rinkside for a nominal rental fee. As always, the food offerings include something for everyone: from regional treats like bratwurst, gingerbread and organic almond cookies, hot punch or mulled wine, to new creations such as hot caipirinha – not to mention such local specialties as barbarenspiess and rahmfleckerl – hard for some visitors to say, perhaps, but easy to eat. Just point! The 20th anniversary edition of the market will also uphold the tradition of outstanding entertainment, with a line-up featuring genres from Bavarian-themed pop to rock, gospel, swing, Latin and jazz. Live acts take the stage from Tuesdays to Sundays starting at 6 pm. There’s plenty of fun in store for the little ones, too, with things to make and do at the market and in Munich Airport’s Kinderland. A new organization called LGBT Hawaii Tourism Association has signed up 40 key stake holders in Hawaii to organize and represent the growing LGBT Travel and Tourism Market to Hawaii.